I think I first read the comic You should’ve asked some time ago, I’m not sure exactly when. 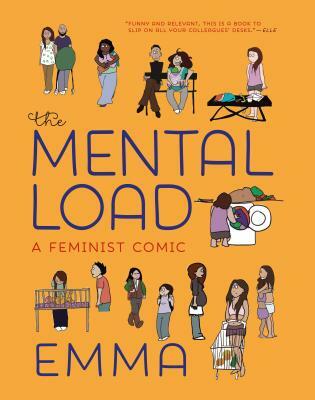 At some point recently, I found out that the author, Emma, has a new book out titled The mental load after a phrase in the above comic, and I knew I had to read it. So I grabbed it from the library and read the whole thing. The rest of the comics in The mental load deal with social justice issues, and run the gamut from women’s issues such as the male gaze, being shrill, and sexual health, to race-based problems like racism in policing and the French burqa ban. She does a really good job of accessibly explaining her points, and taking the reader along as she traces her own journey of waking up, as she calls it, to the inequities inherent in modern society. One story in particular is an allegory to the burqa ban in France that imagines a different future: Europeans have migrated en masse South, to a country where no one wears a shirt at all. The main character of the story has a mother who does where her shirt, and she does as well, as part of her identity; she’s shunned and discriminated against because of a simple wardrobe choice. By reframing the burqa debate in an easier-to-relate way for Western audiences, Emma is able to show how a burqa ban really makes no sense and is, in fact, a form of oppression of a minority group. The comics on motherhood were also eye-opening for me, though the little breakdown she does showing how bad French parental leave is made me cry a little on the inside: at least the French have any parental leave! We really have it bad in the U.S. I don’t have any children right now but when I do, I’m going to make sure not to fall into those gendered patterns of letting R take care of everything. Emma’s art is simplistic and spare, and lets the words do most of the work. I think the format works a little better for a website than a printed book, but I’m glad she’s able to get the notoriety (and money) that a book brings over a blog. I highly recommend going and reading her blog, at least.